In this episode, Kelle invites Carin Baskin, a Conjure practitioner, to join her to talk to us about what Conjure is, where it came from, and how she found herself walking this path. Carin and Kelle also give us some ways that we can get more information about Conjure, as well as some of the other related paths touched on in this episode. Carin wraps up the episode by giving us a couple of Conjure charms to staunch blood and to bring rain. That the blood of <Charm Recipient Name> no longer run at large. “Spirit Sherpa” is the sole property of Kelle Sparta Enterprises and is distributed under a Creative Commons: BY-NC-ND 4.0 license. For more information about this licensing, please go to www.creativecommons.org. Any requests for deviations to this licensing should be sent to kelle@kellesparta.com. To sign up for, or get more information on the programs, offerings, and services referenced in this episode, please go to www.kellesparta.com. This episode of “Spirit Sherpa” has been produced by Honu Voice Productions. In this episode Kelle reminds us that, in order to practice magick, we must make sure that we’ve done the work on ourselves in order to evolve our lives and our energy work. Kelle tells us how, if we don’t do that work, we could end up undervaluing ourselves and blocking ourselves from being able to reach our fullest potential in all aspects of our lives.References:-For more information about Kelle Sparta or Kelle Sparta Enterprises:-Website: www.kellesparta.com-Email: kelle@kellesparta.com-Facebook: https://www.facebook.com/KelleSparta1/-For more information about Joe Caliendo Jr (Joey C) or Honu Voice Productions:-Email: joeyc@honuvoice.com-Facebook: https://www.facebook.com/HonuJoeyC/-Driveabout (Spirit Sherpa Theme): Driveabout (Full Version)-Written by: Kelle Sparta-Performed by: Kelle Sparta and Daniel Singer-Produced by: Daniel Singer Keywords:Kelle Sparta, The Spirit Doctor, Spirit Sherpa, Spirit, Spiritual Life, Manifestation, Magick, Realms, Shaman, Shamanism, Wicca, Paganism, Life Transformation, Personal Journey, Personal GrowthCredits and Licensing:“Spirit Sherpa” is the sole property of Kelle Sparta Enterprises and is distributed under a Creative Commons: BY-NC-ND 4.0 license. For more information about this licensing, please go to www.creativecommons.org. Any requests for deviations to this licensing should be sent to kelle@kellesparta.com. To sign up for, or get more information on the programs, offerings, and services referenced in this episode, please go to www.kellesparta.com. This episode of “Spirit Sherpa” has been produced by Honu Voice Productions. In a delightfully endearing turn of events, in this episode Kelle and Joey C hilariously switch places as Joey C becomes the first Listener Profile and Kelle gets to ask all of the questions. Joey C digs deep and allows listeners to get to know a little bit about him; how his spiritual journey started, what’s going on with him now, and what he plans to do in the near future. This episode is the first of a series of Listener Profiles, so if you’re interested in being featured on the show, please contact Kelle.References:-For more information about Kelle Sparta: www.kellesparta.com--To contact Kelle by email: kelle@kellesparta.com--To connect with Kelle via Facebook: https://www.facebook.com/KelleSparta1/-For more information about Joey C or Honu Voice Productions:--To contact Joey by email: joeyc@honuvoice.com--To connect with Joey via Facebook: https://www.facebook.com/HonuJoeyC/-Driveabout (Spirit Sherpa Theme): Driveabout (Full Version)--Written by: Kelle Sparta--Performed by: Kelle Sparta and Daniel Singer--Produced by: Daniel Singer Keywords:Kelle Sparta, The Spirit Doctor, Spirit Sherpa, Spirit, Spiritual Life, Manifestation, Magick, Realms, Shaman, Shamanism, Wicca, Paganism, Life Transformation, Personal Journey, Personal Growth, Listener Profile, Joey C, Joe Caliendo, Honu Voice Productions, Twin Flames, PodcastingCredits and Licensing:“Spirit Sherpa” is the sole property of Kelle Sparta Enterprises and is distributed under a Creative Commons: BY-NC-ND 4.0 license. For more information about this licensing, please go to www.creativecommons.org. Any requests for deviations to this licensing should be sent to kelle@kellesparta.com. To sign up for, or get more information on the programs, offerings, and services referenced in this episode, please go to www.kellesparta.com. This episode of “Spirit Sherpa” has been produced by Honu Voice Productions. In this episode, Kelle gives us some examples of this we should...and more importantly, SHOULDN’T do when it comes to our energy work. Kelle shares some interesting and amusing stories of where things can, and have, gone wrong and the messages that we can learn from them.References:-For more information about Kelle Sparta: www.kellesparta.com-To contact Kelle email: kelle@kellesparta.com-Driveabout (Spirit Sherpa Theme): Driveabout (Full Version)-Written by: Kelle Sparta-Performed by: Kelle Sparta and Daniel Singer-Produced by: Daniel SingerKeywords:Kelle Sparta, The Spirit Doctor, Spirit Sherpa, Spirit, Spiritual Life, Manifestation, Magick, Realms, Shaman, Shamanism, Wicca, Paganism, Life Transformation, Personal Journey, Personal Growth, Revolutionary War, Dark Elves, Trolls, CrystalsCredits and Licensing:“Spirit Sherpa” is the sole property of Kelle Sparta Enterprises and is distributed under a Creative Commons: BY-NC-ND 4.0 license. For more information about this licensing, please go to www.creativecommons.org. Any requests for deviations to this licensing should be sent to kelle@kellesparta.com. To sign up for, or get more information on the programs, offerings, and services referenced in this episode, please go to www.kellesparta.com. This episode of “Spirit Sherpa” has been produced by Honu Voice Productions. In this episode, Kelle teaches us about astral projection. While in previous episodes Kelle has said that we should never do this because of the dangers involved, she goes more in depth about astral projection in order to inform those who might attempt to do so anyway. When a person astral projects, their soul has left their body and is roaming on the astral plane and the only thing keeping their body alive is the soul’s attachment to the body via a silver cord. If you were to decide to attempt to astral project, you should always set a solid circle of protection and know how to get back to your body. If you’re interested in potentially sharing your spiritual journey on Spirit Sherpa, then please contact Kelle at kelle@kellesparta.com.References:-For more information about Kelle Sparta: www.kellesparta.com-To contact Kelle email: kelle@kellesparta.com-Driveabout (Spirit Sherpa Theme): Driveabout (Full Version)-Written by: Kelle Sparta-Performed by: Kelle Sparta and Daniel Singer-Produced by: Daniel Singer-Book mentioned in episode: Stranger With My Face By: Lois Duncan-Movie mentioned in episode: Somewhere in TimeKeywords:Kelle Sparta, The Spirit Doctor, Spirit Sherpa, Spirit, Spiritual Life, Manifestation, Magick, Realms, Shaman, Shamanism, Wicca, Paganism, Life Transformation, Personal Journey, Personal Growth, Remote Viewing, Astral ProjectionCredits and Licensing:“Spirit Sherpa” is the sole property of Kelle Sparta Enterprises and is distributed under a Creative Commons: BY-NC-ND 4.0 license. For more information about this licensing, please go to www.creativecommons.org. Any requests for deviations to this licensing should be sent to kelle@kellesparta.com. To sign up for, or get more information on the programs, offerings, and services referenced in this episode, please go to www.kellesparta.com. This episode of “Spirit Sherpa” has been produced by Honu Voice Productions. In this episode, Kelle teaches us about Remote Viewing...or the ability to bi-locate your consciousness to allow you to “see” a place outside of your normal view. Kelle talks about what remote viewing is, how it works, and some ways to get started doing. Like many other psychic abilities with low danger levels, she encourages listeners to “play with it” in order to see how strong you are in it. 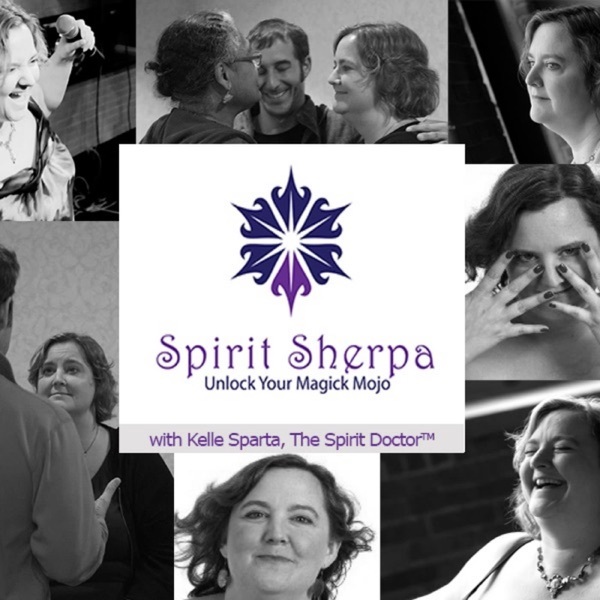 Kelle also talks about some plans she has for future episodes of Spirit Sherpa to include actual listeners of the show sharing their stories and their spiritual journeys with others. If you’re interested in participating (and why wouldn’t you be?? ), email Kelle at kelle@kellesparta.com. Kelle also introduces her Permanent Stress Reduction course (link in references below).References:-For more information about Kelle Sparta: www.kellesparta.comTo contact Kelle email: kelle@kellesparta.com-Driveabout (Spirit Sherpa Theme): Driveabout (Full Version)Written by: Kelle SpartaPerformed by: Kelle Sparta and Daniel SingerProduced by: Daniel Singer-The Men Who Stare at Goats - book by Jon Ronson, published by Picador and Simon & Schuster, 2004-The Men Who Stare at Goats - directed by Grant Heslov, produced by Smoke House Pictures and BBC Films, 2009- Kelle’s Permanent Stress Reduction Course - http://permanentstressreduction.comKeywords:Kelle Sparta, The Spirit Doctor, Spirit Sherpa, Spirit, Spiritual Life, Manifestation, Magick, Realms, Shaman, Shamanism, Wicca, Paganism, Life Transformation, Personal Journey, Personal Growth, Remote Viewing, The Men Who Stare At Goats, Astral Projection, Permanent Stress ReductionCredits and Licensing:“Spirit Sherpa” is the sole property of Kelle Sparta Enterprises and is distributed under a Creative Commons: BY-NC-ND 4.0 license. For more information about this licensing, please go to www.creativecommons.org. Any requests for deviations to this licensing should be sent to kelle@kellesparta.com. To sign up for, or get more information on the programs, offerings, and services referenced in this episode, please go to www.kellesparta.com. This episode of “Spirit Sherpa” has been produced by Honu Voice Productions. In this episode, Carin Baskin joins Kelle as they discuss spirit communication, channeling, and possession. Spirit communication is a conversation between you and spirit, whereas during channeling spirit enters your body. Channeling can be either unconscious or semi-conscious. During unconscious channeling your consciousness takes a “nap” while spirit uses your body to deliver messages whereas during a semi-conscious channel you are conscious of everything that is taking place while spirit is speaking through you and you can veto anything being said or done. Lastly, possession is a forcible taking over of your body without your permission. Unconscious channeling is like possession except in unconscious channeling you are giving your permission. Unconscious channeling is not advised.References:-For more information about Kelle Sparta: www.kellesparta.comTo contact Kelle email: kelle@kellesparta.com-For more information about Carin Baskin: www.ghosts-begone.comTo contact Carin by email: carin@ghosts-begone.com-Driveabout (Spirit Sherpa Theme): Driveabout (Full Version)Written by: Kelle SpartaPerformed by: Kelle Sparta and Daniel SingerProduced by: Daniel SingerKeywords:Kelle Sparta, The Spirit Doctor, Spirit Sherpa, Spirit, Spiritual Life, Manifestation, Magick, Realms, Shaman, Shamanism, Wicca, Paganism, Life Transformation, Personal Journey, Personal Growth, Carin Baskin, Astral Plane, Possession, Channeling, Spirit Communication, Unconscious Channeling, Semi-Conscious ChannelingCredits and Licensing:“Spirit Sherpa” is the sole property of Kelle Sparta Enterprises and is distributed under a Creative Commons: BY-NC-ND 4.0 license. For more information about this licensing, please go to www.creativecommons.org. Any requests for deviations to this licensing should be sent to kelle@kellesparta.com. To sign up for, or get more information on the programs, offerings, and services referenced in this episode, please go to www.kellesparta.com. This episode of “Spirit Sherpa” has been produced by Honu Voice Productions. In this episode, Carin Baskin from ghosts-begone.com joins Kelle again as they discuss psychic self-defense. Kelle explains that, as we engage in more energy workings, we begin to appear more “bright and shiny” on the astral plane, thereby attracting more things that may want to feed on our energy. Kelle and Carin also discuss the difference between this “feeding” and direct (or indirect) attacks from other people or beings. Listeners are given some stories of personal experiences as well as tips and tricks on how to protect themselves from these situations.References:-For more information about Kelle Sparta: www.kellesparta.comTo contact Kelle email: kelle@kellesparta.com-For more information about Carin Baskin: www.ghosts-begone.comTo contact Carin by email: carin@ghosts-begone.com-Driveabout (Spirit Sherpa Theme): Driveabout (Full Version)Written by: Kelle SpartaPerformed by: Kelle Sparta and Daniel SingerProduced by: Daniel Singer -Carin’s Shower Energy Clearing CharmWater wash the ill away, water wash it gone.As the darkness fades away, comes the rising sun.Water, water, water, water, water wash it gone.Water, water, water, water, water wash it gone.Water, water, water, water, water wash it gone.Water wash the ill away, water wash it gone.As the darkness fades away, comes the shining sun.Should be repeated at least 3 timesKeywords:Kelle Sparta, The Spirit Doctor, Spirit Sherpa, Spirit, Spiritual Life, Manifestation, Magick, Realms, Shaman, Shamanism, Wicca, Paganism, Life Transformation, Personal Journey, Personal Growth, Carin Baskin, Psychic Self-Defense, Harry Potter, Shields, Astral Plane, Defense Against The Dark Arts, Demons, Possession, Witch, Gluten Intolerance, House Clearing, Violet Flame, Mirror Shield, Grounding, The Law Of AttractionCredits and Licensing:“Spirit Sherpa” is the sole property of Kelle Sparta Enterprises and is distributed under a Creative Commons: BY-NC-ND 4.0 license. For more information about this licensing, please go to www.creativecommons.org. Any requests for deviations to this licensing should be sent to kelle@kellesparta.com. To sign up for, or get more information on the programs, offerings, and services referenced in this episode, please go to www.kellesparta.com. This episode of “Spirit Sherpa” has been produced by Honu Voice Productions. In this episode, Kelle welcomes back Carin Baskin from ghosts-begone.com to discuss clearing your space. Carin and Kelle give the listeners some things to look for to tell when it’s time to have your space cleaned and some simple ways to get started. Listeners are delighted by some personal stories from Kelle and Carin about past experiences related to discordant energy and the things they’ve done to clean it. Be sure to listen to the whole episode to hear a very special offer for Spirit Sherpa listeners from Carin on her house clearing services.References:-For more information about Kelle Sparta: www.kellesparta.comTo contact Kelle email: kelle@kellesparta.com-For more information about Carin Baskin: www.ghosts-begone.comTo contact Carin by email: carin@ghosts-begone.com-Driveabout (Spirit Sherpa Theme): Driveabout (Full Version)Written by: Kelle SpartaPerformed by: Kelle Sparta and Daniel SingerProduced by: Daniel SingerKeywords:Kelle Sparta, The Spirit Doctor, Spirit Sherpa, Spirit, Spiritual Life, Manifestation, Magick, Realms, Shaman, Shamanism, Wicca, Paganism, Life Transformation, Personal Journey, Personal Growth, Carin Baskin, Home Cleaning, Energy Cleaning, Discordant Energy, Energetic HygieneCredits and Licensing:“Spirit Sherpa” is the sole property of Kelle Sparta Enterprises and is distributed under a Creative Commons: BY-NC-ND 4.0 license. For more information about this licensing, please go to www.creativecommons.org. Any requests for deviations to this licensing should be sent to kelle@kellesparta.com. To sign up for, or get more information on the programs, offerings, and services referenced in this episode, please go to www.kellesparta.com. This episode of “Spirit Sherpa” has been produced by Honu Voice Productions. In this episode, Kelle invites Carin Baskin, a Conjure practitioner, to join her to talk to us about what Conjure is, where it came from, and how she found herself walking this path. Carin and Kelle also give us some ways that we can get more information about Conjure, as well as some of the other related paths touched on in this episode. Carin wraps up the episode by giving us a couple of Conjure charms to staunch blood and to bring rain.References:-For more information about Kelle Sparta: www.kellesparta.comTo contact Kelle email: kelle@kellesparta.com-For more information about Carin Baskin: www.ghosts-begone.comTo contact Carin by email: carin@ghosts-begone.com-Driveabout (Spirit Sherpa Theme): Driveabout (Full Version)Written by: Kelle SpartaPerformed by: Kelle Sparta and Daniel SingerProduced by: Daniel Singer-Mama Starr Casas: http://www.oldstyleconjure.com/-The Skeleton Key (Movie): Universal Pictures, 2005, https://en.wikipedia.org/wiki/The_Skeleton_Key-Cloak and Dagger (TV Series): ABC Signature Studios/Marvel Television, 2018+, https://en.wikipedia.org/wiki/Cloak_%26_Dagger_(TV_series)-Staunch Blood Charm:By the blood of Adam, sin was taken,By the blood of Christ, it all was shaken,And by that same blood I do thee charge,That the blood of <Charm Recipient Name> no longer run at large.-Bring the Rain CharmAbjure the blood, and all its stainsTo blacken the skies, in witchcraft’s nameTo raise the winds, and bell the DameTo bring the rain, to bring rain-For More Information on Conjure, Carin recommends the following books:Staubs and Ditchwater by H. Byron BallardAsfidity & Mad-Stones by H. Byron BallardThe Conjure Workbook: Volume I: Working the Root by Starr CasasOld Style Conjure by Starr CasasWorking Conjure by Hoodoo Sen MoiseThe Candle and the Crossroads by Orion Foxwood**Please note: While these are not “beginners” books, they do have great content that Carin recommends**Keywords:Kelle Sparta, The Spirit Doctor, Spirit Sherpa, Spirit, Spiritual Life, Manifestation, Magick, Realms, Shaman, Shamanism, Wicca, Paganism, Life Transformation, Personal Journey, Personal Growth, Conjure, Carin Baskin, Folkloric Magic, Christianity, Santeria, Slave Trade, Old Testament, Hoodoo,Voodoo, Fairy, Mama Starr Casas, Old Style Conjure, Jewish, The Skeleton Key, Voodon, Haiti, Cloak And Dagger, Marvel Comics, Folk Magic Festival, New Orleans, American Folkloric Magic, Witchcraft, Spells, Rituals, High Magick, Low Magick, Jehovah, Christ, Recipes, Workings, Intent, Sugar Jars, Vinegar Jars, Sour Jars, Morphic Field, Bay Leaves, Geometry, Rosemary, Superstition, Old Country, Folkloric Threads, Ethics, Blood MagickCredits and Licensing:“Spirit Sherpa” is the sole property of Kelle Sparta Enterprises and is distributed under a Creative Commons: BY-NC-ND 4.0 license. For more information about this licensing, please go to www.creativecommons.org. Any requests for deviations to this licensing should be sent to kelle@kellesparta.com. To sign up for, or get more information on the programs, offerings, and services referenced in this episode, please go to www.kellesparta.com. This episode of “Spirit Sherpa” has been produced by Honu Voice Productions. In this episode, Kelle talks about the akashic records. The akashic records are all of the pieces of information that exist in the eternal moment of now, or in the zero point field. Everything that happens, all pieces of information, and all events exist simultaneously in the eternal moment of now and if you can tap into that space, then you can have access to any piece of information from the akashic record. Answers come out of the record in many formats; auditory, visual, feelings, etc.References:-For more information about Kelle Sparta: www.kellesparta.comTo contact Kelle email: kelle@kellesparta.com-Driveabout (Spirit Sherpa Theme): Driveabout (Full Version)Written by: Kelle SpartaPerformed by: Kelle Sparta and Daniel SingerProduced by: Daniel SingerKeywords:Kelle Sparta, The Spirit Doctor, Spirit Sherpa, Spirit, Spiritual Life, Manifestation, Magick, Realms, Shaman, Shamanism, Wicca, Paganism, Life Transformation, Personal Journey, Personal Growth, Akashic Records, Akashic Record, Eternal moment of now, Zero PointCredits and Licensing:“Spirit Sherpa” is the sole property of Kelle Sparta Enterprises and is distributed under a Creative Commons: BY-NC-ND 4.0 license. For more information about this licensing, please go to www.creativecommons.org. Any requests for deviations to this licensing should be sent to kelle@kellesparta.com. To sign up for, or get more information on the programs, offerings, and services referenced in this episode, please go to www.kellesparta.com. This episode of “Spirit Sherpa” has been produced by Honu Voice Productions. In this episode, Kelle introduces a recurring episode theme that she plans to incorporate into the show - Magickal Paths. Every couple of episodes, Kelle with highlight a new magickal path getting deeper into what it is (and sometimes, what it isn’t), some of the benefits and cautions about that path, and how people can find out more information about it. This week, Kelle opens up with a path she is very familiar with: Shamanism. She takes us through some of the types of paths within Shamanism itself and the foundation that ties all of them together. Kelle also takes some time in this episode to answer some more questions from listeners about chakras and testing yourself for psychic abilities.References:-For more information about Kelle Sparta: www.kellesparta.comTo contact Kelle email: kelle@kellesparta.com-Driveabout (Spirit Sherpa Theme): Driveabout (Full Version)Written by: Kelle SpartaPerformed by: Kelle Sparta and Daniel SingerProduced by: Daniel SingerSpirit Sherpa Episodes: Ep. 013: A Discussion of Magickal Traditions and High Magick vs. Low MagickSpirit Sherpa Episodes: Ep. 002: Becoming A ShamanJohn Fire Lame Deer Wiki: https://en.wikipedia.org/wiki/John_Fire_Lame_DeerLame Deer, Seeker of Visions by John (Fire) Lame Deer and Richard ErdoesKeywords:Kelle Sparta, The Spirit Doctor, Spirit Sherpa, Spirit, Spiritual Life, Manifestation, Magick, Realms, Shaman, Shamanism, Wicca, Paganism, Life Transformation, Personal Journey, Personal Growth, Magickal Paths, Wicca, Hermeticism, Conjure, Imbolc, Winter, Winter Solstice, Spring Equinox, Summer Solstice, Chakras,Tree People, Creepy Crawlies, Stone People, Spiritual Family, Ancestors, Pachamama, Father Sky, Grandmother Moon, Ancestors, Lame Deer, John Fire Lame Deer, Seeker of Visions, Telekinesis, ESP, Psychic AbilitiesCredits and Licensing:“Spirit Sherpa” is the sole property of Kelle Sparta Enterprises and is distributed under a Creative Commons: BY-NC-ND 4.0 license. For more information about this licensing, please go to www.creativecommons.org. Any requests for deviations to this licensing should be sent to kelle@kellesparta.com. To sign up for, or get more information on the programs, offerings, and services referenced in this episode, please go to www.kellesparta.com. This episode of “Spirit Sherpa” has been produced by Honu Voice Productions. In this episode, Kelle discusses angels and demons and their roles on the spiritual plane as well as the similarities and differences between them. Kelle also takes an opportunity to answer questions from some listeners including addressing some concerns that many have regarding the mixing of some religious beliefs into their magickal and spiritual practices.References:-For more information about Kelle Sparta: www.kellesparta.comTo contact Kelle email: kelle@kellesparta.com-Driveabout (Spirit Sherpa Theme): Driveabout (Full Version)Written by: Kelle SpartaPerformed by: Kelle Sparta and Daniel SingerProduced by: Daniel SingerGeneral Audience with Pope John Paul II, 28 July 1999: http://w2.vatican.va/content/john-paul-ii/en/audiences/1999/documents/hf_jp-ii_aud_28071999.htmlKim Harrison - The Hollows Series (including Dead Witch Walking): https://www.kimharrison.net/SecondaryPages/BookOrder.htmlSpirit Sherpa Episode - “The Immortals - Elves and What You Need to Know”: https://app.pippa.io/public/streams/spirit-sherpa/episodes/ep-028-the-immortals-elves-and-what-you-need-to-know.mp3Keywords:Kelle Sparta, The Spirit Doctor, Spirit Sherpa, Spirit, Spiritual Life, Manifestation, Magick, Realms, Shaman, Shamanism, Wicca, Paganism, Life Transformation, Personal Journey, Personal Growth, Angels, Demons, Christianity, Satan, Christ, Mythos, Archangels, Lilith, Heaven, Hell, Pope John Paul II,Good, Evil, God, Divine, Kim Harrison, Dead Witch Walking, The Hollows SeriesCredits and Licensing:“Spirit Sherpa” is the sole property of Kelle Sparta Enterprises and is distributed under a Creative Commons: BY-NC-ND 4.0 license. For more information about this licensing, please go to www.creativecommons.org. Any requests for deviations to this licensing should be sent to kelle@kellesparta.com. To sign up for, or get more information on the programs, offerings, and services referenced in this episode, please go to www.kellesparta.com. This episode of “Spirit Sherpa” has been produced by Honu Voice Productions. In this episode, Kelle discusses Chants and Trance. Chants are simple songs designed to call in certain energies. When chants are used in a group, it aligns the energy of the group participants. A trance is stepping out of your normal conscious state when moving to music; it’s a loss of awareness of your surroundings and a complete focus on the movement of the body. Trancing is not meditation even though it can feel meditative. Instead, during meditation you are not aware of your body and completely in your head.References:-For more information about Kelle Sparta: www.kellesparta.comTo contact Kelle email: kelle@kellesparta.com-Driveabout (Spirit Sherpa Theme): Driveabout (Full Version)Written by: Kelle SpartaPerformed by: Kelle Sparta and Daniel SingerProduced by: Daniel Singer-For more information about Kirtan: https://en.wikipedia.org/wiki/Kirtan-For more information about Abigail Spinner McBride: https://www.facebook.com/people/Abigail-Spinner-McBride/100016167999361 or https://store.cdbaby.com/Artist/AbbiSpinnerMcBride-For more information about Shawna Carol Goddess Chant: https://g.co/kgs/yHUJzF-For more information about Earth Spirit Community: http://www.earthspirit.com/Keywords:Kelle Sparta, The Spirit Doctor, Spirit Sherpa, Spirit, Spiritual Life, Manifestation, Magick, Realms, Shaman, Shamanism, Wicca, Paganism, Life Transformation, Personal Journey, Personal Growth, Chants, Chanting, Trance, TrancingCredits and Licensing:“Spirit Sherpa” is the sole property of Kelle Sparta Enterprises and is distributed under a Creative Commons: BY-NC-ND 4.0 license. For more information about this licensing, please go to www.creativecommons.org. Any requests for deviations to this licensing should be sent to kelle@kellesparta.com. To sign up for, or get more information on the programs, offerings, and services referenced in this episode, please go to www.kellesparta.com. This episode of “Spirit Sherpa” has been produced by Honu Voice Productions. In this episode, Kelle defines the ego. The ego is the part of ourselves that is based on all of our experience, good and bad, that becomes our personality. It also becomes the part of ourselves that holds our belief systems and limits. The idea behind spiritual work is to reframe the ego such that we retain those parts of us that work well, but to remove or reshape the parts of the ego that limit our lives and keep us stuck.References:-For more information about Kelle Sparta: www.kellesparta.comTo contact Kelle email: kelle@kellesparta.comKelle’s Webinar: 5 Simple Steps to Finally Break Free From Your Challenged Childhood-For more information about Eckhart Tolle: www.eckharttolle.com/-Driveabout (Spirit Sherpa Theme): Driveabout (Full Version)Written by: Kelle SpartaPerformed by: Kelle Sparta and Daniel SingerProduced by: Daniel SingerKeywords:Kelle Sparta, The Spirit Doctor, Spirit Sherpa, Spirit, Spiritual Life, Manifestation, Magick, Realms, Shaman, Shamanism, Wicca, Paganism, Life Transformation, Personal Journey, Personal Growth, Elves, Challenged ChildhoodCredits and Licensing:“Spirit Sherpa” is the sole property of Kelle Sparta Enterprises and is distributed under a Creative Commons: BY-NC-ND 4.0 license. For more information about this licensing, please go to www.creativecommons.org. Any requests for deviations to this licensing should be sent to kelle@kellesparta.com. To sign up for, or get more information on the programs, offerings, and services referenced in this episode, please go to www.kellesparta.com. This episode of “Spirit Sherpa” has been produced by Honu Voice Productions. In this episode, Kelle gives a brief overview of faeries. The faerie world consists of many different types of beings: brownies, pixies, borrowers, ceely, unceely, trolls, gnomes, and elementals (i.e., wind, water, earth, and fire) to name a few. The fae are more strongly connected to Mother Earth than any other type of being. Kelle talks about which faeries are very safe to work with and which ones you may wish to avoid, but the fae, in general, are much safer to work with than the elves.References:-For more information about Kelle Sparta: www.kellesparta.comTo contact Kelle email: kelle@kellesparta.com-Driveabout (Spirit Sherpa Theme): Driveabout (Full Version)Written by: Kelle SpartaPerformed by: Kelle Sparta and Daniel SingerProduced by: Daniel Singer-The Faeries’ Oracle by Brian Froud and Jessica MacbethKeywords:Kelle Sparta, The Spirit Doctor, Spirit Sherpa, Spirit, Spiritual Life, Manifestation, Magick, Realms, Shaman, Shamanism, Wicca, Paganism, Life Transformation, Personal Journey, Personal Growth, faeries, brownies, pixies, gnomes, ceely, unceely, borrowers, trollsCredits and Licensing:“Spirit Sherpa” is the sole property of Kelle Sparta Enterprises and is distributed under a Creative Commons: BY-NC-ND 4.0 license. For more information about this licensing, please go to www.creativecommons.org. Any requests for deviations to this licensing should be sent to kelle@kellesparta.com. To sign up for, or get more information on the programs, offerings, and services referenced in this episode, please go to www.kellesparta.com. This episode of “Spirit Sherpa” has been produced by Honu Voice Productions. In this episode, Kelle talks about the immortal beings, the Elves. The Elves are not like those depicted in the Lord of The Rings movies, with regard to personality. Kelle describes the Elves as being extremely literal beings, the judges of the spirit world, and cautions listeners against interacting with these beings without prior experience or knowledge. In this episode Kelle also offers listeners a free webinar; “5 Simple Steps to Finally Break Free From Your Challenged Childhood”.References:-For more information about Kelle Sparta: www.kellesparta.comTo contact Kelle email: kelle@kellesparta.comKelle’s Webinar: 5 Simple Steps to Finally Break Free From Your Challenged Childhood-Driveabout (Spirit Sherpa Theme): Driveabout (Full Version)Written by: Kelle SpartaPerformed by: Kelle Sparta and Daniel SingerProduced by: Daniel SingerKeywords:Kelle Sparta, The Spirit Doctor, Spirit Sherpa, Spirit, Spiritual Life, Manifestation, Magick, Realms, Shaman, Shamanism, Wicca, Paganism, Life Transformation, Personal Journey, Personal Growth, Elves, Challenged ChildhoodCredits and Licensing:“Spirit Sherpa” is the sole property of Kelle Sparta Enterprises and is distributed under a Creative Commons: BY-NC-ND 4.0 license. For more information about this licensing, please go to www.creativecommons.org. Any requests for deviations to this licensing should be sent to kelle@kellesparta.com. To sign up for, or get more information on the programs, offerings, and services referenced in this episode, please go to www.kellesparta.com. This episode of “Spirit Sherpa” has been produced by Honu Voice Productions. In this episode, Kelle discusses the shamanic idea of the waking dream; the idea that you create your own reality, like a dream. Anyone that you interact with is a figment of your dream and you are a figment of theirs, and so on. Whatever happens inside of you is also happening outside of you, so whatever happens in your daily life is also mirrored in your internal world. If it exists outside of you, then you have called it into being. These events are reflections of your core story.References:-For more information about Kelle Sparta: www.kellesparta.comTo contact Kelle email: kelle@kellesparta.com-Driveabout (Spirit Sherpa Theme): Driveabout (Full Version)Written by: Kelle SpartaPerformed by: Kelle Sparta and Daniel SingerProduced by: Daniel Singer-For more information about Joe Vitale: www.joevitale.comKeywords:Kelle Sparta, The Spirit Doctor, Spirit Sherpa, Spirit, Spiritual Life, Manifestation, Magick, Realms, Shaman, Shamanism, Wicca, Paganism, Life Transformation, Personal Journey, Personal Growth, the waking dreamCredits and Licensing:“Spirit Sherpa” is the sole property of Kelle Sparta Enterprises and is distributed under a Creative Commons: BY-NC-ND 4.0 license. For more information about this licensing, please go to www.creativecommons.org. Any requests for deviations to this licensing should be sent to kelle@kellesparta.com. To sign up for, or get more information on the programs, offerings, and services referenced in this episode, please go to www.kellesparta.com. This episode of “Spirit Sherpa” has been produced by Honu Voice Productions. In this episode, Kelle gives some tips for choosing a spiritual teacher. She refers to the episode of her podcast that teaches the stages of spiritual evolution and warns against relying on a person who is in Stage 3 of their spiritual evolution (the prove it stage) when looking for a long-term, in depth spiritual teacher. The teacher in Stage 3 is still proving to themselves that they are worthy of teaching and might have trouble handing back a student’s power when it is time to do so.References:-For more information about Kelle Sparta: www.kellesparta.comTo contact Kelle email: kelle@kellesparta.com-Driveabout (Spirit Sherpa Theme): Driveabout (Full Version)Written by: Kelle SpartaPerformed by: Kelle Sparta and Daniel SingerProduced by: Daniel SingerKeywords:Kelle Sparta, The Spirit Doctor, Spirit Sherpa, Spirit, Spiritual Life, Manifestation, Magick, Realms, Shaman, Shamanism, Wicca, Paganism, Life Transformation, Personal Journey, Personal GrowthCredits and Licensing:“Spirit Sherpa” is the sole property of Kelle Sparta Enterprises and is distributed under a Creative Commons: BY-NC-ND 4.0 license. For more information about this licensing, please go to www.creativecommons.org. Any requests for deviations to this licensing should be sent to kelle@kellesparta.com. To sign up for, or get more information on the programs, offerings, and services referenced in this episode, please go to www.kellesparta.com. This episode of “Spirit Sherpa” has been produced by Honu Voice Productions. In this episode, Kelle and special guest, Kathy Scheiern, discuss the ethics of magickal practice. Many unethical behaviors are the result of boundary violations; you cannot look into someone’s energy without permission, you cannot take something that you don’t have permission to take, and you don’t act when you don’t have permission to act. When magickal practices are done in an ethical way with clean and clear boundaries it can help people grow and transform in positive ways.References:-For more information about Kelle Sparta: www.kellesparta.comTo contact Kelle email: kelle@kellesparta.com-For more information about Kathy Scheiern: yourbigbreakthroughcoach.com-Driveabout (Spirit Sherpa Theme): Driveabout (Full Version)Written by: Kelle SpartaPerformed by: Kelle Sparta and Daniel SingerProduced by: Daniel SingerKeywords:Kelle Sparta, The Spirit Doctor, Spirit Sherpa, Spirit, Spiritual Life, Manifestation, Magick, Realms, Shaman, Shamanism, Wicca, Paganism, Life Transformation, Personal Journey, Personal Growth, Ethics, Boundaries, PermissionCredits and Licensing:“Spirit Sherpa” is the sole property of Kelle Sparta Enterprises and is distributed under a Creative Commons: BY-NC-ND 4.0 license. For more information about this licensing, please go to www.creativecommons.org. Any requests for deviations to this licensing should be sent to kelle@kellesparta.com. To sign up for, or get more information on the programs, offerings, and services referenced in this episode, please go to www.kellesparta.com. This episode of “Spirit Sherpa” has been produced by Honu Voice Productions. In this episode, Kelle gives an overview of the stages of personal growth from the time that a personal becomes aware of the universe around them. Her description of each stage talks about how a person feels during that stage and what the activities are take place during each stage using some of her own personal stories as examples.Stages of Personal Growth:1) Discovery – “Wow, does this stuff really work? How cool would it be if it did.” 2) Proof and Proselytizing – “OMG this stuff really does work! I must read everything I can get my hands on, take every class I can possibly manage and tell everyone I know (so they can help me believe what I’m seeing)!” (Introverts usually skip the proselytizing.) 3) Prove It - Releasing Stories – “Let me teach you what I’ve learned about this – it will help me go deeper and give you some really valuable info.” (Again, introverts often skip this stage.) 4) Retreat for Personal Practice/Study – Releasing “Being Right”– “No, I’m not teaching anyone right now – I’m doing my own research.” In this phase, we are asked to look into our shadow selves and begin the work of clearing out issues. 5) Surrender To The Universe/Learning To BE – Releasing Control – Where you look at the universe in response to the bizarre, illogical, dare I say crazy thing it has just asked you to do and say “You want me to do WHAT??! ?” And then you go and do it anyway. 6) Discovering Yourself – Choosing WHO To Be - Once you’ve mastered surrender at the first level, then you have to balance it with choice – without going into control. “What do you mean you’re not going to tell me what to do next? I’ve been sitting here (sorta) patiently for NOTHING!? !” 7) Awareness and Reflection – Letting Go of Your Story of Who You Are – Beginning to see yourself as you really are – not as you hope/fear/desire to be. Includes asking for reflections from others. 8) Stripping Down – Letting Go of Fear-Based Responses That Hide Your True Self – Identifying and removing masks, coping mechanisms, and judgment-based patterns to find the real you underneath it all. Also stripping away all positive labels and layered-on positive assessments of self. 9) Self-Acceptance – Letting Go of Judgment of Self – This is where you learn to step into your power and trust yourself with that power. 10) Self-Love – Stillness and Peace – Letting Go of The Need To Be Different Than You Are – Developing true love and compassion for the self. Embrace a willingness to be vulnerable.References:-For more information about Kelle Sparta: www.kellesparta.comTo contact Kelle email: kelle@kellesparta.com-Driveabout (Spirit Sherpa Theme): Driveabout (Full Version)Written by: Kelle SpartaPerformed by: Kelle Sparta and Daniel SingerProduced by: Daniel SingerKeywords:Kelle Sparta, The Spirit Doctor, Spirit Sherpa, Spirit, Spiritual Life, Manifestation, Magick, Realms, Shaman, Shamanism, Wicca, Paganism, Life Transformation, Personal Journey, Personal Growth, Spiritual Evolution, Stages of EvolutionCredits and Licensing:“Spirit Sherpa” is the sole property of Kelle Sparta Enterprises and is distributed under a Creative Commons: BY-NC-ND 4.0 license. For more information about this licensing, please go to www.creativecommons.org. Any requests for deviations to this licensing should be sent to kelle@kellesparta.com. To sign up for, or get more information on the programs, offerings, and services referenced in this episode, please go to www.kellesparta.com. This episode of “Spirit Sherpa” has been produced by Honu Voice Productions. How Do I Evolve? What Are The Stages of Spiritiual Evolution?